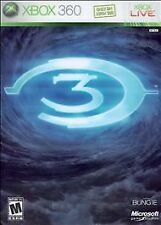 Halo 3 for Xbox 360. This item is genuine, original. If you are not happy with it we will work to fix the problem. Just let us know. They arenot included in the listed price. Super Nintendo. 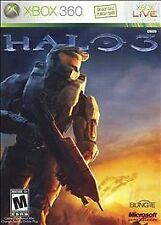 Halo 3 -- Limited Edition (Microsoft Xbox 360, 2007). Condition is Like New. Shipped with USPS Priority Mail. This game discs have some scuffs and light scratches on them. The steel book case has some shelf wear (scuffs and dents). 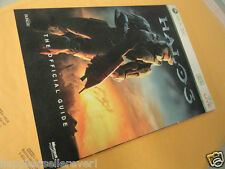 Please see the photos.This listing includes game disc, essentials disc, manual, and artbook. Sega GT2002. Assassins Creed. Splinter Cell. Grand Theft Auto III. Cases and included manuals are in good condition. Only a handful were ever produced and given only to the staff, of those only a few were signed, none of these ever make it out of the BUNGIE inner circle. For privacy reasons the owner of the helm will not be released until sale is final. XBOX 360 CAMPAIGN HALO 3 ODST and HALO4 Disc 2. Condition is Acceptable(Game Disc only). Shipped with USPS First Class Package. Halo 3 Limited Edition. Essentials disc from. disc has a few scratches but in working order. Halo 3 Essentials. Halo Reach. They are Xbox ONE compatible! Next morning if after 5pm. Halo 3 Limited Edition. disc has scratches but in working order. Condition - Tested and working. ( See photos). Discs have minor wear from being played. 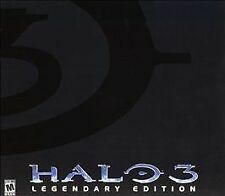 Halo 3 Legendary Edition Game & Essentials DVD Only. Condition is Used. Consider Yourself Covered. I do my best to describe each item including their flaws. If you don't see it pictured, it ISN'T INCLUDED! Case is a little beat up as seen in the pictures. discs are in mint condition. 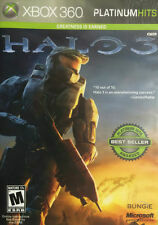 Used Halo 3 (Microsoft Xbox 360, 2007) Disc ONLY!